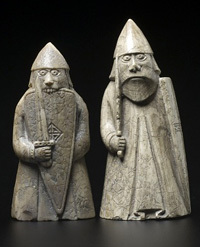 The Lewis Chessmen are carved mostly from walrus ivory with a few pieces carved from whale teeth. The carvings are finely detailed and character has been infused into the pieces. The pieces were found in impeccable condition; nearly new, in fact. The only part of the chessmen that did not weather the test of time was the colouring of the set. Some of the pieces have red staining on them that has eroded, likely during the time the pieces spent buried in the sand. This gives good indication that the game of chess in medieval times was played with red and white forces rather than the black and white of modern chess. The chessmen collection contains eight kings, eight queens, 16 bishops, 15 knights, 12 warders that are the medieval version of modern rooks, and 19 pawns. There is a variance of sizing in the pieces, which indicates that the set is likely comprised from four or five separate sets. The detailing of the pieces is fantastic and has given character and expression to each of the pieces. The King. The crowned kings all sit upon their respective thrones with a sword held across their laps. They all sit slightly forward and appear to be looking down. Their posture gives them the appearance of contemplation as though they were viewing the situation and deliberating on the next move to make. The thrones are carved with flora and fauna. The faces of the kings are either cleanly shaven with recessed chins or have full beards and thin faces. The Queen. The queens, all with a veil beneath their crowns to cover their hair, are sitting with their left arms across their laps and the hands supporting the right elbows. They are resting their cheeks in their right hands. They are leaning slightly forward, similar to the kings, with shoulders that appear to be stooped. Though a few claim that the queens seem to be expressing boredom, more people attribute their facial expression and posture to deep contemplation and sorrow. The queens are believed to be viewing the destruction of warfare taking place before them and are considering how to best ease sorrow and repair the situation. The Bishops. Some of the bishops are standing; others are sitting. They are all wearing mitres and hold crosiers. A few are holding a book while others hold their hand up in a traditional gesture of blessing. It is the mitres worn by the bishops that have helped scholars and historians date the pieces, the one area of the set that is not under debate and discussion. The mitres depicted on the chess pieces have peaks at the front and back with a small depression between. Prior to the introduction of this design in 1150 AD, mitres were worn with the peaks on the sides and the valley running from front to back. The design of this head wear changed again in 1200 AD. This gives certainty to the information that the pieces were crafted between 1150 and 1200 AD. It is ironic that the piece that allows historians to accurately state when they were made is also the piece that is a key factor in the dissension over where they were made. The Knights. The knights bear shield and sword and sit atop their trusted steeds. The horses are miniature in size when compared with the knights and are said to be Icelandic in appearance. The armour and shield of the knights, though, are thought to be exact duplications of the armour that was worn by warriors in Norway. 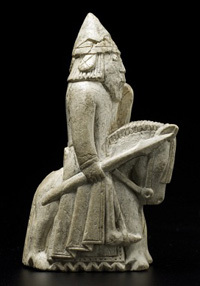 It is believed that the human figures of the chess set were created in sizes relative to the role of their real-life counterparts. The knights could not be larger than the king but had to be larger than the rooks; in order for these pieces to fit the squares of the board then, compromise had to be made by reducing the scale of the horse. The Rooks. Also referred to as warders or armed guardians, the rooks give comedic relief to the debates regarding the chessmen. The rooks are all adorned with helmet, shield and sword with some men standing as traditional warriors and others in berserker stance. 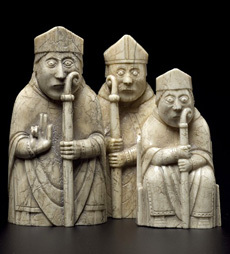 It is the pieces that are made to resemble berserkers that are most often the cause for smiles in those viewing the exhibited pieces. The pieces that show the warriors biting their shields and having eyes that seem ready to pop out of their heads may be viewed today as caricatures or cartoon depictions of fighting men but at the time that they were crafted they were viewed as ferocious and frenzied fighters. The berserkers were famed fighters of Norse legend that would enter into a trance-like state and fight with an uncontrolled fury that inspired great fear in those that faced them during battle. The Pawns. The pawns are simple pieces that resemble towers or obelisks. These pieces were created in a very similar style to the pieces used in even older Islamic versions of chess that decreed only abstract forms could be part of the game and that no pieces could bear resemblance to any human or animal form. 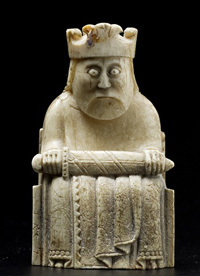 The detailing of the chessmen was executed in such a fine and intricate manner that it is agreed only a master artisan could have created such sublime pieces from the walrus ivory or whale's teeth. 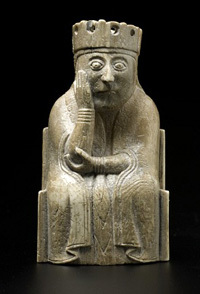 From the facial expressions to the carvings on the thrones, the Lewis Chessmen are works of art as well as works of history.